Impact crusher is a mining machinery commonly used for ore crushing. The crushed aggregate produced by the impact crusher looks good, so the impact crusher is very good in the ore crushing process. As the mechanical equipment for the crushed ore, the machine needs to be inspected after the first installation to prevent some problems in the process of crushing the ore in the later stage. What are the problems that need to be paid attention to during the first installation of the impact crusher? 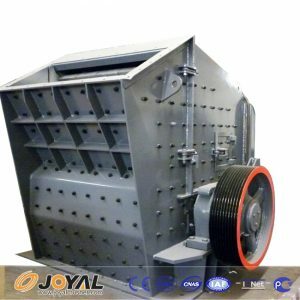 Shanghai Joyal Mining Machinery is a simple manufacturer of mining machinery and equipment. It is very important for everyone to install the impact crusher for the first time. Joyal hopes that the majority of users can pay attention to it. Because the impact crusher has a certain frequency and strength vibration during normal use, the unit must be constructed in strict accordance with the basic drawings provided by the manufacturer to prevent other problems. Users need to pay attention to the need to install the impact crusher according to the characteristics of the impact crusher parameters, increase the safety factor, and carefully calculate the special custom prefabricated panels after construction. When installing the impact crusher, pay attention to the alignment of the motor pulley and the impact crusher pulley, and tighten it properly. It should also be considered that when working, the working environment should be kept dry and ventilated to prevent rain, snow, dust and other erosion of the motor. Protective equipment such as protective covers and overload protectors are also required to ensure the safety of equipment and personnel.